Maximum Cutting capacity at 90 deg: 65 mm. Maximum Cutting capacity at 45 deg: 42 mm. Maximum Cutting Depth: 32 mm. A Space Saving Yet Efficient Tool. Crafted With Advanced Scientific Technology and, Thus, Makes Precise Cuts. Backed By A Strong 1, 350-Watt Motor Which Is The Reason For Its Powerful Performance. Has A Secure Lock System For Safety. 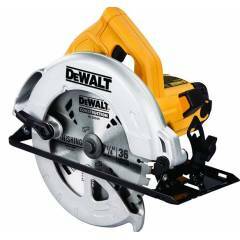 Dewalt 1200W DWE561A 500rpm Circular Saw is a premium quality Circular Saws from Dewalt. Moglix is a well-known ecommerce platform for qualitative range of Circular Saws. All Dewalt 1200W DWE561A 500rpm Circular Saw are manufactured by using quality assured material and advanced techniques, which make them up to the standard in this highly challenging field. The materials utilized to manufacture Dewalt 1200W DWE561A 500rpm Circular Saw, are sourced from the most reliable and official Circular Saws vendors, chosen after performing detailed market surveys. Thus, Dewalt products are widely acknowledged in the market for their high quality. We are dedicatedly involved in providing an excellent quality array of Dewalt Circular Saws.